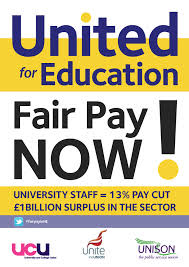 Strike action might be entering the hot phase later this year as the Universities and Colleges Union (UCU) has approved ‘a marking boycott to be implemented from 28 April if university employers still refuse to thrash out a deal over pay’. The Universities and Colleges Employers Association ‘have so far refused to engage in any meaningful talks over pay, despite six strikes since October 2013 and increasingly vociferous complaints from students about cancelled classes and missed seminars.’ So their employees are now going to strike where it hurts most, and it is the students who are going to suffer. It is unfortunate that things had to come this far. Academic staff do not want to hurt their students. Lecturers are aware how important marks are to them, especially to final-year and postgraduate students who are going to apply for jobs and will be desperately waiting for their results. But nothing else will now make a difference. staff have been offered a pay rise of just 1%, which would leave them with a real-terms pay cut of 13% since 2009. While staff pay has been kept down, vice-chancellors enjoyed an average pay rise of 5.1% last year, and an average salary of £235,000. Some surveys shock us, others fill us with a sense of relief that it’s not just us. The recent Research Excellence Framework (REF) survey undertaken by the University and College Union (UCU) does both. In UCU’s 2012 Stress at Work survey ‘over 59% of respondents in HE indicated they worked 46 or more hours a week’ (while being paid for 35), and ‘over 35% worked 51 or more hours.’ Over half of the respondents felt ‘pressured to work long hours’, with many citing the REF as contributing factor to this pressure. I don’t need a UCU survey to tell me that. I have seen my colleagues panicking about getting that last item for their REF submission out on time, panicking about the quality of the book they had to rush out before the deadline, even though an extra month or two might have enabled them to add that extra bit of research that would have given it the edge. I have also panicked myself hoping to exchange an item I didn’t like so much by something I felt would rate more highly. I have also chided myself for spending my time editing collected essays while the University keeps telling me the two books I have been so proud of and enjoyed so much producing with my friends and colleagues won’t count much in the world of the REF. They want monographs and articles in the top journals. You know the story.